Madonna’s personal tag line is “a 360 degree perspective of food service” with an extensive food service background. 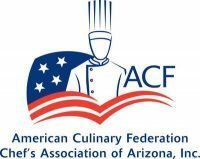 In the role of Marketing and Events for the American Culinary Federation Chefs of Arizona, she is able to utilize that experience to support the objectives set by the ACF AZ, our sponsors and the membership. Madonna is also working with the Institute of Food Technology Cactus Chapter as well creating symbiotic relationship between the two organizations in Arizona. She is one person in a large role with endless opportunities to move our associations in the direction of our goals. We encourage you to contact her about planning an event, participating in an ACF AZ or ACF SCAAZ meeting or helping support our organizations.